A common misconception in regards to reconditioned boilers is the reliability of the equipment. Many buyers don't realize that a reconditioned boiler can actually run just as efficiently as a new boiler, but is typically 60% of the cost! This, along with many other advantages, can easily justify buying a reconditioned boiler over a new boiler. Delivery - Manufacturer's lead times can be 6 months to a year nowadays. 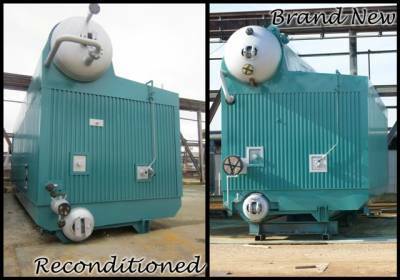 Reconditioned boilers are generally in stock and available for immediate delivery. Warranty - Nationwide Boiler offers the same guarantee for new and reconditioned boilers, warranted for 6-12 months. Rent to Own - With a new boiler, you don't usually have the option of rent to own. A Nationwide reconditioned boiler can be rented with an option to buy at the end of the rental. Quality - As mentioned, the quality of a reconditioned boiler is commonly misconceived. Nationwide Boiler has established procedures and is an ASME code certified shop. Every reconditioned boiler is internally inspected and hydro-statically tested, with all systems checked prior to delivery to ensure quality and usability. Performance - A new boiler purchased from the manufacturer can be designed to meet specific needs, however a reconditioned boiler can be retrofitted to meet current industry standards; ASME, low emissions, control, etc. Start-up - A new boiler is generally put on line in 2-3 weeks, while a Nationwide reconditioned boiler is always thoroughly shop tested, reducing field start-up time. Installation - With a new boiler purchase, installation is generally not an option and part of the customer's scope of supply. Nationwide can offer complete turnkey installations for customers purchasing reconditioned boilers. Service Calls - Equipment manufacturer's typically can only be reached during normal working hours. Nationwide Boiler's service engineer's can be reached 24 hours a day at our toll-free number, 1-800-227-1966. Next time you are in the market for a boiler and have to make the tough decision of buying a new or used boiler, be sure to take these factors into consideration! Cleaver-Brooks is offering another free webinar to educate boiler owners, plant managers, and anyone involved in the decision making process when it comes to buying a new boiler. The webinar will be held tomorrow, August 26th at 11 am PST. The webinar will offer a brief overview of the different types of boilers available and focus on what criteria should be evaluated when choosing a boiler that best meets the requirements of an application. The program is strongly recommended for engineers, design-build contractors and anyone else involved in the boiler selection process for new projects, renovations and/or additions. Don't miss out on this opportunity, register today! Next week Nationwide Boiler will be exhibiting at the first annual PowerGen Natural Gas Tradeshow in Columbus, OH. This 3-day event, August 18 - 20, will bring industry professionals together to discuss the biggest trend in power generation today: the move to natural gas. If you are interested in buying a new, gas-fired boiler for expansion or to replace your existing equipment, Nationwide Boiler can help! If you are already in the process of buying but need temporary equipment during your coal to gas conversion, we can supply a rental boiler to keep your plant running. In addition, we can help reduce your NOx emissions on your fired equipment with the Nationwide CataStak SCR system. Visit Nationwide's Bill Testa, Jim Barbeau and Sean McMenamin at PowerGen Natural Gas, booth #316, to learn more! Rental Boiler Requires 350 Ton Crane for Loading! Nationwide Boiler's 100,000 lb/hr watertube boiler has begun it's journey to Los Angeles for a six month rental. The boiler weighs nearly 100,000 lbs and required a 350 ton crane for truck loading. Once the rental is complete, the customer has the option to buy the boiler for permanent steam supply.